Today is the day- I’m excited to spread the word about the relaunch of B is for Bonnie Design! Bonnie contacted me last fall to chat about making the move to WordPress in the future and collaborate on her new site. I’m so glad she did, this was a dream project to work on! 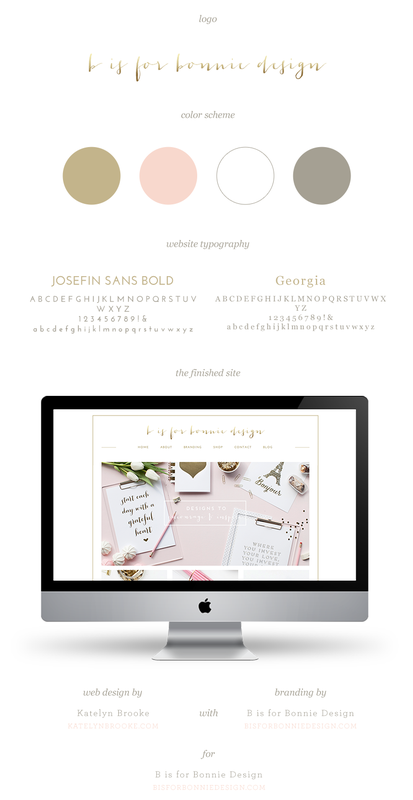 Bonnie is really talented, and I just love her branding that she designed! Bonnie was a breeze to work with, we had a so much fun putting this together! I love her clean but feminine style, and Shay Cochrane did an amazing job on the photography! Bonnie also has a sweet giveaway running right now to celebrate her launch, go check it out! I can’t pick out a favorite detail on this one, all her pages are really fun! Go explore! Nice work! I’m loving the color palette! Very pretty colors, nice work! Gorgeous! I love how everything came together so perfectly! Love the clean design, beautiful work!